Happy Quilting: And the Gift Certificate goes to . . . .
And the lucky number according to Mr. Random.Org is . . . Which is . . . . Pianomama!!!! Congrats :) I have emailed you for your info. Thanks for a great giveaway Melissa and congratulations to pianomama! 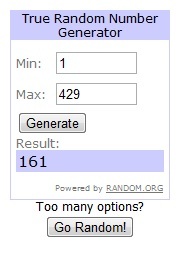 Congratulations to the winner and thank you for hosting another great give away.